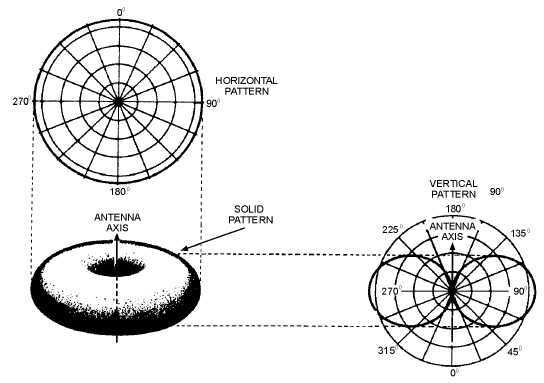 Here's a pic of the doughnut hole that exists above the vertically polarized antenna. In this case, it looks like a 1/2 wave dipole antenna is providing the RF field. Here's another pic, showing you the field from above too. What we seem to be seeing in these pics, is a doughnut of power, that reaches a fixed distance from the dipole source. But in reality, we are only being shown the Strongest field. What isn't being shown, are the larger weaker fields. There are more doughnuts that aren't being shown. Visulize this doughnut as a car tire inner tube. Then picture, it's inside of a large truck tire inner tube. Then picture a third tube, even larger, outside the two smaller tubes. The skin of those additional tubes represent points in space, of RF power. The outside skin/layers of the 'onion', are the weaker layers. Whereas the inside layers are where the signal is stronger. As time passes, these layers are expanding away from the antenna at the speed of light (C), getting larger (and weaker) with each meter. After one second, the outer layer of the onion ring has traveled 300 million meters from the source. It has become extremely large. It's 600 million meters across. (And around 300 million meters tall). So, the little 1/2 wave 1090 MHz dipole has coverage out 300 million meters (186,000 miles).?. yeah!! If there was a Mode-S / ADS-B satellite 300 million meters out in space, with a very strong signal, you could could hear it.. If it was really strong, you could still hear it at greater ranges.. The outside of the doughnut is speeding away from the earth at the speed of C..
As it gets more and more distant, it becomes fatter and fatter. Much weaker too. But, as it's heading for infinity, it becomes so weak.. It drops below our current ability to detect. It is so fat out there, the most distant layer is almost directly overhead. RF transmitted from the antenna travels in a straight line. has a layer that is almost directly above my antenna. This explains why I can track a plane flying from Maine down to NYC, and never see signal loss when it's passing directly over my antenna location.. It gets a little weaker, but not by much. Since it's so close.